Peterborough Panthers’ main men starred as the city club’s SGB Championship hot streak continued last night (September 26). Number one Jack Holder reeled off a four-ride maximum to spearhead a 51-39 success against Scunthorpe at the East of England Arena, while British star Chris Harris and skipper Ulrich Ostergaard amassed impressive double-figure hauls of their own. But a fourth successive victory was as frustrating as it was satisfying – providing yet another reminder of what might have been this season. If only Panthers had managed to put all seven men on track more often, a top-four place would surely have been in reach. Instead, they find themselves completing a series of largely meaningless meetings at a time when the battle for honours is reaching a conclusion elsewhere. But the attitude and application of the Panthers septet can only be admired as they eased past opponents they face again this Friday (September 29) in a considerably more important KO Cup quarter-final second leg. The prospect of another piece of silverware is no doubt a major source of motivation. Team boss Johnson said: “It was a tough meeting, but we pulled away in the final few races to keep our good run going. “We went out to lay a marker down ahead of the cup clash on Friday and we did that. “It might look like we don’t have a lot to play for in the league, but we’re determined to finish as high as we possibly can - and taking it easy is not something that speedway riders do. Johnson wasn’t wrong. The track looked in top condition and plenty of the action produced only emphasised that point. Scunthorpe opted to use gates two and four in the opener, but their duo of Jake Allen and Lewis Kerr could only admire a blistering start as Holder burst from the trap between them. The Australian talent was a decisive winner of a shared contest, but it was the visitors who hit the front when reserve Josh Bailey went tapes to flag to inspire a 4-2 in the second instalment. Ostergaard was rewarded for a race-long pursuit of Ryan Douglas in a re-run third heat when pouncing on a mistake from the visiting rider in the final bend to grab victory. Paul Starke’s third place ensured Panthers immediately pulled themselves level and that’s the way it stayed through a couple of shared contests. The home side hit the front for the first time when Holder and Bradley Wilson-Dean bagged a 5-1 over Josh Auty in a terrific three-way battle in heat six. Ostergaard suffered his sole defeat at the hands of an opponent when having to settle for third spot in the ninth race, but that contribution – combined with a victory from partner Starke – was enough to extend Panthers’ advantage to six points. 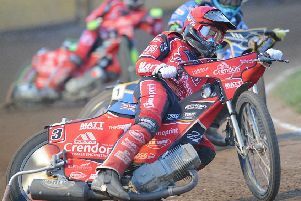 It was cut when Scunthorpe collected a 4-2 of their own in heat 11 as the impressive Allen held off Harris and visiting reserve Tero Aarnio’s triumph in the next race ensured the outcome remained in the balance. But Panthers’ star performers ensured there was no need to panic as two 5-1s in the final three races provided an exciting climax. Holder completed his full house with a fine last-to-first blast in heat 13 and Harris delivered a super swoop round the outside to follow his partner home. That’s now nice race wins in a row for Holder after he triumphed in his last four outings during an away win at Glasgow nine days earlier. Ostergaard then took the wide line to great effect as he sealed victory in a shared penultimate race and the skipper teamed up with Harris to provide a sparkling finish in a re-run finale after Auty tumbled out of the initial staging. Johnson added: “We’ve come to expect performances like that from Jack after such a fine season. We sometimes forget he is still only 21 and learning his trade. PETERBOROUGH: Chris Harris 12+1, Ulrich Ostergaard 12+1, Jack Holder 12 (max), Paul Starke 6, Bradley Wilson-Dean 4+1, Tom Bacon 3+3, Simon Lambert 2. SCUNTHORPE: Jake Allen 10+1, Josh Auty 7, Ryan Douglas 6+2, Tero Aarnio 5+1, Lewis Kerr 4+1, Michael Palm Toft 4, Josh Bailey 3. 1 - Holder (59.6), Allen, Kerr, Wilson-Dean. 3-3, 3-3. 2 - Bailey (61.1), Lambert, Aarnio, Bacon. 2-4, 5-7. 3 – re-run Ostergaard (61.3), Douglas, Starke, Palm Toft. 4-2, 9-9. 4 - Auty (60.7), Harris, Bacon, Bailey. 3-3, 12-12. 5 - re-run Ostergaard (60.5), Kerr, Allen, Starke. 3-3, 15-15. 6 - Holder (61.6), Wilson-Dean, Auty, Aarnio (ret). 5-1, 20-16. 7 - Harris (60.5), Palm Toft, Douglas, Lambert. 3-3, 23-19. 8 - Allen (61.8), Wilson-Dean, Bacon, Bailey. 3-3, 26-22. 9 - Starke (62.0), Auty, Ostergaard, Aarnio. 4-2, 30-24. 10 - Holder (62.4), Palm Toft, Douglas, Wilson-Dean. 3-3, 33-27. 11 - Allen (62.6), Harris, Kerr, Lambert. 2-4, 35-31. 12 - re-run Aarnio (63.0), Starke, Bacon, Bailey (Palm Toft exc 2 mins). 3-3, 38-34. 13 - re-run Holder (63.2), Harris, Auty, Kerr. 5-1, 43-35. 14 - Ostergaard (62.9), Douglas, Aarnio, Lambert. 3-3, 46-38. 15 - re-run Harris (63.2), Ostergaard, Allen, Auty (fell/exc). 5-1, 51-39.